Kathryn Bigelow’s sprawling Bin Laden hunt picture is a spotty affair, a film sectioned off into often disjointed segments over the course of ten years only finding it’s rhythm in the second half of the picture. The rivetting climax is a masterwork of military procedural execution, easily smoothing over the rocky 2 hours which came before it. 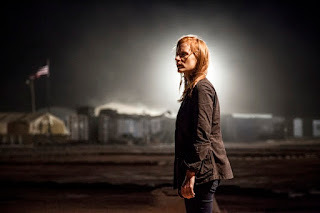 Zero Dark Thirty thus resounds as both a conversation piece and a rip-roaring action film. The intensity of the final sequences, the lead up to and assault on the Bin Laden compound shows the best of Bigelow’s skills - the intimate moments of intense conflict, something demonstrated consistently throughout her career. The Hurt Locker, its Oscar wins notwithstanding, arguably, exhibited the same qualities, working marvelously within the individual set pieces but strangely vacant in the big picture. Perhaps by design the first 30mins, featuring a series of detainee interrogations (aka torture), through which CIA head Maya Bradley (Chastain) finds her first lead, is a slow and difficult hump to get over. While some have questioned this depiction as condoning the tactic, Bigelow’s matter-of-fact treatment of the torture seems as much like Lance Armstrong’s recent competitive admonitions, a level playing field/win-at-all costs attitude, where the end justifies the means. Whether it’s right or wrong is inconsequential. Within the minds of Bigelow’s characters we believe wholeheartedly this is the means to their end. The name Abu Ahmed, a courier for Bin Laden becomes Maya’s main target, find the delivery man and you find Bin Laden. But as time goes by and multiple claims of his death abound Maya’s resolve is questioned. When someone who may or may not be Abu Ahmed is traced to a fortified compound in a Pakistani city, the film’s best scene emerges. A supremely tense briefing of Maya, her former partner Dan (Clarke) and a roll call of uber-male military advisors laying out the probabilities of Bin Laden’s presence in that compound. James Gandolfini in a short but remarkable role exudes all the chauvenistic male bravodo that we presume Maya pushes up against everyday in her job. Chastain’s strong performance, conveying the confidence in her investigation and her willingness to risk her career on her hunches is the most powerful moment in the film. After this, it’s Bigelow in action-movie mode where she’s most comfortable, crafting the procedural lead up and execution of the military’s assault on the compound. This sequence works like a film-within-a-film. Aiding in the sprawling nature of the timeline is the employment of strong and recognizable actors who come in and out of the picture as Maya’s hunt changes course. Throughout memorable actors such as Mark Strong, Mark Duplass, Edgar Ramirez, Stephen Dillane appear and disappear. In these final scenes we’re introduced to a Navy Seal team featuring familiar faces Joel Edgerton and Chris Pratt as some of the regular ‘Joes’ entrusted with killing America’s most wanted. Invariably when dealing with recent history, and mostly unreported and undocumented history, the issue of authenticity can overstate itself. What resounds most here is a profound theme of this unique war. While, in the moment, the excessive torture sequences threaten to exhaust us, they foreshadow Bigelow’s theme which emerges in the end, the idea of the war on terror as a war of attrition, and like Lance Armstrong’s mantra, win-at-all costs. Judge if you will.